BetChain, one of the world’s biggest bitcoin online casinos, recently started offering online casino gaming services in a tenth language. 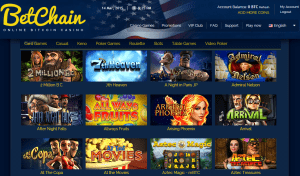 As a result, it is now the only bitcoin casino that offers gaming services in 10 languages. BetChain Casino aims at becoming available to players from different parts of the world. Now that it offers gambling services in 10 languages, it has become an internationally acclaimed bitcoin online casino. The online casino is now available in Swedish along with Dutch, Spanish, and German. BetChain Casino operates under a license issued by the Government of Curacao. It functions on the SoftSwiss casino gaming software platform and offers an impressive portfolio of more than 200 online casino games released by multiple providers such as Amatic, Endorphina, and BetSoft. Some of the hottest games in the BetChain portfolio are poker, blackjack, and roulette. The online casino is especially popular for BetSoft’s collection of 3D slots. BetChain is also popular for its VIP program and affiliate program. The latter gives affiliates the chance to earn commissions of up to 50%. Customer support is excellent as it includes 24/7 live chat, which enables players to get in touch with a customer care representative instantly. In addition, BetChain Casino has integrated Cubits, a platform that allows consumers to purchase, accept, and sell bitcoins. Thanks to Cubits, players can make deposits in Euros, which then get converted into bitcoins. Players can also withdraw their winnings in Euros. BetChain Casino offers a first depositor cash match bonus of 110% up to 0.5BTC. High rollers can claim a larger bonus of 100% up to 3BTC if they deposit at least 1BTC. There is also a special slots bonus of 300% up to 0.1BTC. Before claiming any of these bonuses, players should note that certain terms and conditions apply. BetChain also gives away up to 50 free spins on featured slots every Friday, and players do not even have to make a deposit to qualify for these free spins. The promotion is called Free spins Fridays. BetChain claims that it is the first bitcoin online casino to offer up to 50 free spins as part of a promotion.